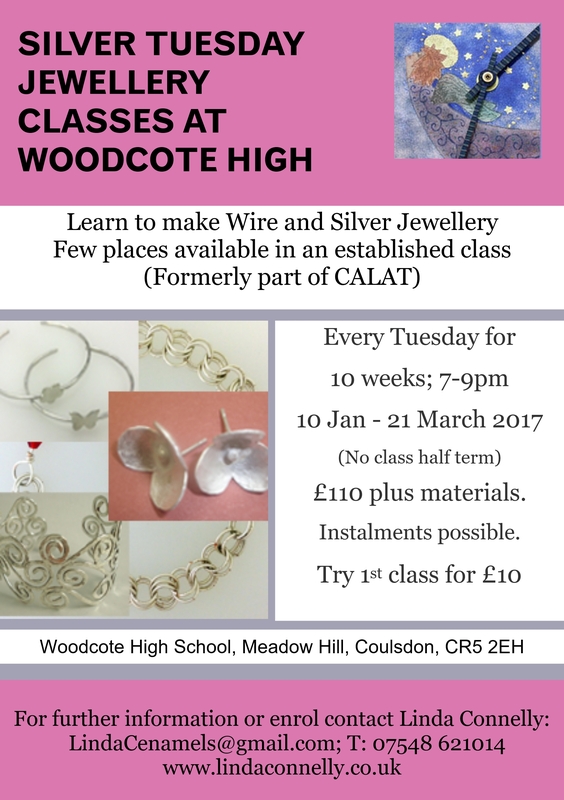 I have been running this Jewellery Class on a Tuesday evening for the past twelve years. It used to be part of CALAT but when they ceased offering practical classes like this I was able to buy all the tools and rent premises to carry on. I have been operating on this basis since April 2016. I have a total of 12 students and I have two places available in January 2017. The class is suitable for all levels from beginners to experienced. 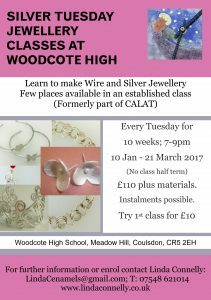 It is well equipped and operates from a spacious workshop room in Woodcote High School, Coulsdon, Surrey onTuesday evenings 7pm – 9pm. We have ten week terms with no class in the school half term. Message me for further information. Update. All places now filled but contact me if you would like to go on waiting list.